If it wasn't for fusion food, my morning would be omelette less and that could be such a pity. And atleast half the time in the week, there would be no breakfast for M. And that's only calling trouble later in the day when M becomes extremely finicky when he didn't have his breakfast right. How the fusion that took place ages ago can make my life a happy one! You see, omelette was something the British introduced to India. While the British ruled over India, they turned the traditional simple omelette to an Indian fair by adding spices to it. During the era, the dinner was still more British but the lunch and breakfast was often a fusion of eastern and western cuisine. Food has never been so largely influenced, changed, fusion and developed as during the imperialism era. And much of what we eat today has a background of fusion elements in some point in history. 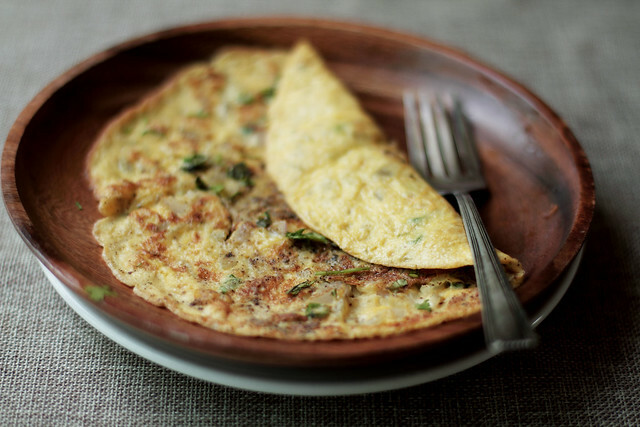 Indian omelette is a simple and quick marriage of distinctively Indian flavors with the humble egg. Indian omelette is thinner, slightly golden on one side. From a simple onions and chilies omelette to tomato, cheese to herb studded omelette, all of it has been embraced by the breakfast and brunch restaurants all over India. 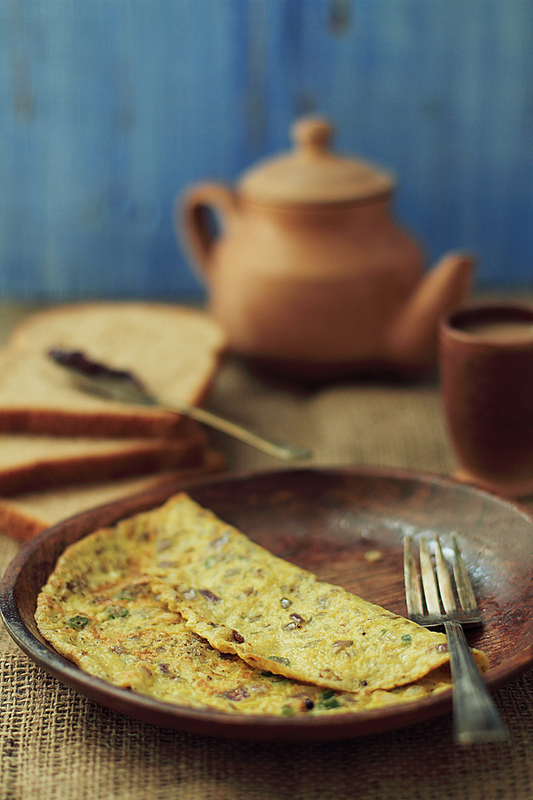 Most days, a simple Indian omelette is all we want but weekends are made special with the cheesy and herby ones. Next time, you are thinking eggs for breakfast, try this Indian omelette version and tell me how you like it. Though its perfect for brunch or lunch too. * Turmeric adds a light lovely golden hue as well as helps mask the egg smell if you are one of those people. Whisk the egg with turmeric until foathy. Mix in the onions, green chillies, coriander leaves and whisk well. Heat ghee in a non stick frying pan, and immediately add the egg mixture on medium low heat. Season with salt and pepper on one side. Let the egg cook on one side for couple of minutes and then flip it to cook on the other. It cooks relative fast on the other side, so don't over cook. Add more pepper if required. Serve sandwiched between white toast or rolled with roti or on its own. My family certainly adds ketchup to go with it. Yay for fusion food! Your pics are gorgeous, as usual. Lovely pictures of a true Indian classic! LOVE! that is the only word for this dish- LOVE! It is lovely and pretty and so tempting! You are the bomb girl. Come enter my baking giveaway today if you get a chance! I'm drooling right now! Amazing photos Kulsum! I'm so in love with this omelette I can barely BREATHE. That clay tea pot... is it from your recent India trip? so cute! I love Indian Omelettes! Sometimes I put in leftover veggies too.. They taste awesome! Looks very good; love the Indian flavors with the eggs. This looks fantastic Kulsum! And your photos are so beautiful. And yes this omelet is kind of a staple breakfast in my family! Mmm how interesting -- much more flavorful than my usual! I love the spices here, I make mine thin like that too. Beautiful pictures rich with atmosphere. Fabulous clicks and lovely omelet! I love your journey of omelette. A staple in India it is. I have one everyday of the year. I wonder if a link up of my omelette tales can be put here.. I took some photos once. Lovely reading your account. The only thing I se happening differently is the medium of cooking. I have not seen an omelette cooked in ghee over the last few decades. I remember a very long time ago when it was made in hydrogenated veg oil... but since the advent of regular processed oil... most of it is cooked in that. @Anoop - Thanks so much for sharing your links here for everyone to see. I think this whole processed oil phenomena was something India could have avoided. The world went processed and we followed, but now as more studies are conducted, people in the west are coming to learn health benefits of Ghee, coconut oil , mustard oil etc which have been used in India for centuries. Yummy! Photos look warm, earthy and inviting. In India, this was a staple Sunday breakfast- so many good memories there. I love the fact that you used ghee..
Omelette is a staple in most Indian homes and a weekly fare in mine. At times I cook it in coconut oil & use ghee too for a unique flavor :) Totally loved your props Kulsum--wooden plate, teapot--all of them! This is real staple on a weekend or during the weekdays as well. Omlette is beautifully made kulsum. oh how can i live without an omelette? and such a beautifully photographed one too? very nice dish! I love omlette anything so I'll try yours for sure. 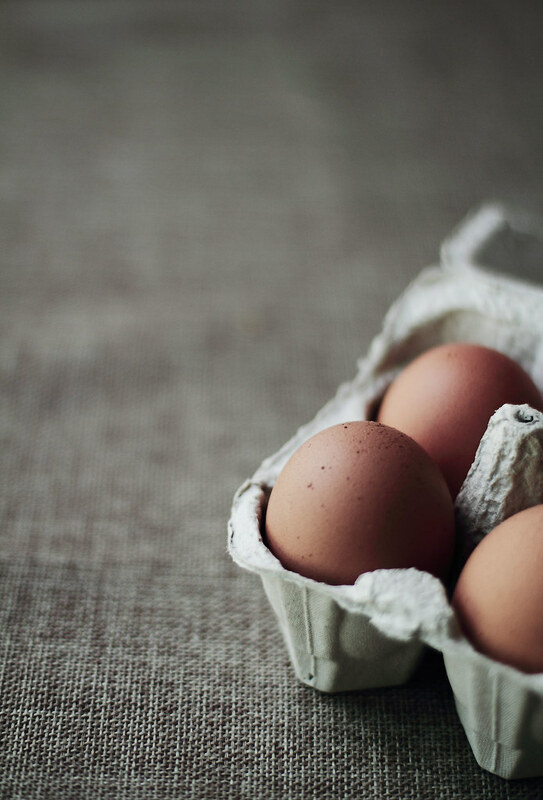 For me a winter breakfast surely includes eggs..and Indian way is the way we like it too..lovely clicks!! My dad used to make delicious spicy omelets that were to die for. 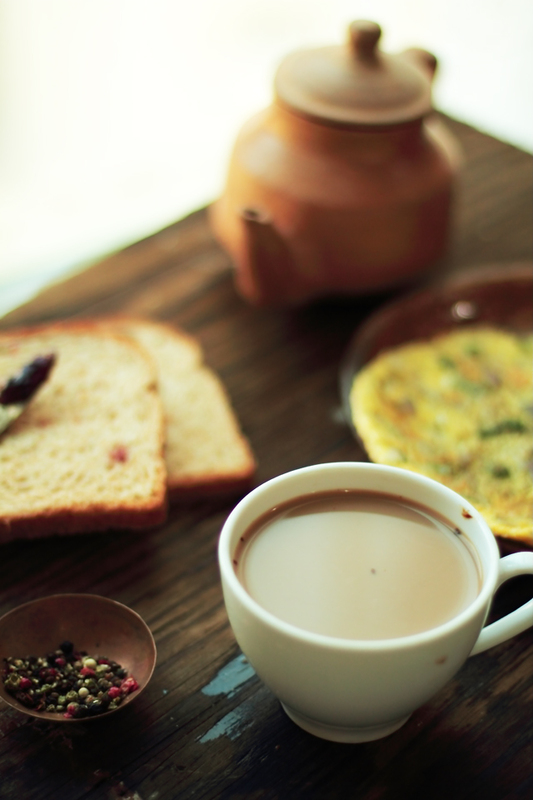 Always awesome with a cup of masala chai! OOOOOh didn't realise the Indian fusion omelette is slightly thinner. We usually have a version of this as our lazy dinner once a week. Love it! What a great new idea for an omelette! I make omelettes often, so I'll try it soon! I love omelette, never fail to make me happy after eating it! Will you consider it another fusion if I try the omelette without ghee? :) Or may be I should steal some ghee from my Indian friends. Love what you wrote about the evolvement of food. Without influences of other cultures, our cuisines will not be as exciting as it is now. I can't imagine Malaysia cuisine without Indian influences, or Chinese influences and the list goes on..
Btw, is that chai tea that you made for M? Beautiful photos and I am loving the pancake-like consistency of the omelette. Can't wait to try it out! Fusion rules!- and wow, what a great photographer you are! How wonderful that you were finally able to post your version of the Indian omelet! :-) And you make this everyday?! You are awesome! For us, it's weekend brunch or weeknight dinner. Lovely photographs! Try adding in 1/2 tsp of minced ginger next time. That's my favorite! !